The cinder-block walls and windowless offices of IUPUI’s Cavanaugh Hall have aged rather gracelessly over more than four decades. The utterly functional brutal modernist building will inevitably meet the wrecking ball someday, but in the meantime administrators extend the decaying structure’s life with a host of makeshift changes. 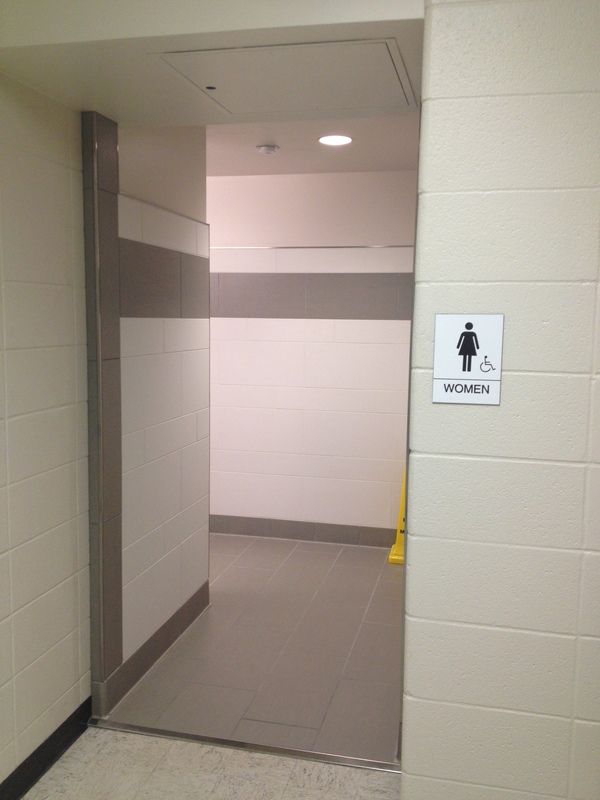 The most recent renovations have come to a series of women’s restrooms (men’s apparently will undergo similar changes soon), which are now appointed with new tile, another set of toilets, and a slightly different floor plan. None of those changes has prompted more fevered discussion than the installation of a labyrinth entrance; that is, the new bathrooms have no doors. The labyrinth design is intended to minimize germ transmission and make restrooms more secure spaces, and nothing is literally visible from the adjoining public hallway; nevertheless, the absence of doors and the sonic amplification provided by the tile have unleashed a host of anxieties that illuminate the unmentionable, underscore the divisions between public and private spaces, and highlight the limits of functional restroom design. Former Air Guitar World champions Justin “Nordic Thunder” Howard (2012) and Markus “Black Raven” Vainionpää (2000) tutor three audience members in air guitar (image Aleke Ollila). 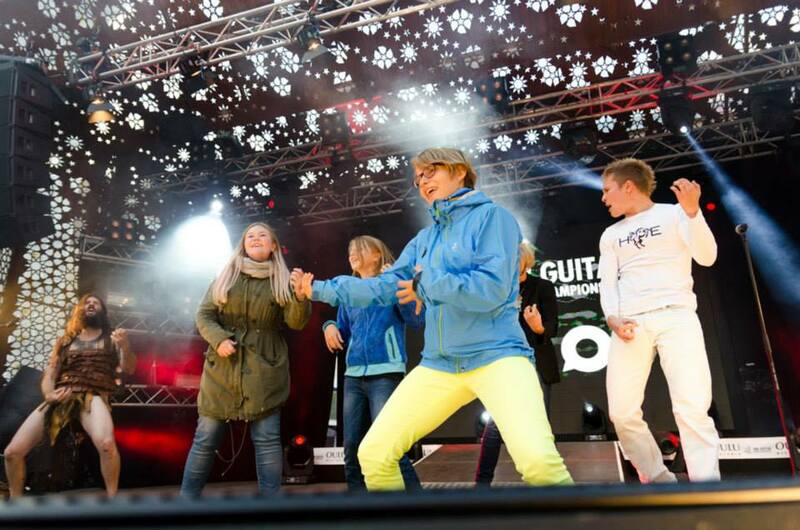 There may be no more audacious pursuit of global justice than the Air Guitar World Championship’s aspiration to “promote world peace. According to the ideology of the Air Guitar, wars would end, climate change stop and all bad things disappear, if all the people in the world played the Air Guitar.” It is perhaps difficult to conceive of a host of global diplomats exaggerating the fluid moves of Jimmy Page and Jimi Hendrix, yet last week a legion of the faithful gathered in Oulu, Finland for the 19th annual Air Guitar World Championship’s unique performance of self-aware camp, bold sincerity, naïve optimism, and playful theatre. 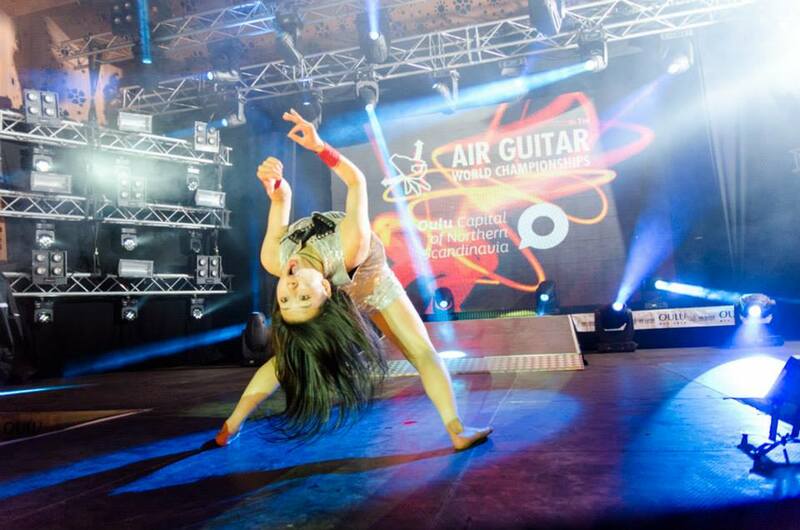 Air guitar is quite possibly among the most democratic if not egalitarian of all expressive arts. Even the clumsiest person is capable of reproducing the familiar motions of guitar players, and it harbors an interesting politics of community that may not yield world peace, but it is a fascinating and idealistic starting point.